Fill The Steins: Thanks very much for taking the time to participate in our Q&A; series. Let’s start off easy…what is your major and year of graduation? Whitneigh Kinne: I will be graduating this year with a major in Mass Communication and a minor in Business Administration. FTS: Where did you grow up? What were your interests as a kid? WK: I grew up in North Yarmouth, Maine, where my parents still live. It is roughly 20 minutes outside of Portland. Growing up, I did various forms of dance: ballet, tap, jazz, street-funk, hip hop and point. I took karate lessons for a while and was one stripe away from being able to test for a black belt. FTS: No wonder you’re not intimidated by those big, bad hockey players. What made you choose the University of Maine over other schools? WK: Ever since I was very young I knew I wanted to attend the University of Maine. It was actually the only school I applied to. When I was growing up, I spent a lot of my weekends in Orono with my family watching hockey games. My stepmom was also very active in the Alumni Association, so I made connections with alumni through her. Two of my older brothers attended and graduated from UMaine and so did my two sisters-in-law. After seeing how much they loved it here, there was no way I was going anywhere else. The University of Maine community is really special and I think most of us don’t realize that until after we graduate. People think I am kidding when I say, I could go to college the rest of my life, but I am very serious. I don’t think there is anyone else in the world that loves the University of Maine more than I do. FTS: That’s definitely evident from listening to your broadcasts. What’s your favorite part of being a student at UMaine? WK: Making so many friends over the last four years, but honestly I love it all and am having a difficult time facing graduation. It may be time to graduate but I will miss being a student at UMaine. FTS: That feeling doesn’t go away…we’re still having a hard time facing graduation, and we graduated 13 years ago. What are the origins of your love of hockey? WK: It’s actually a pretty funny story! I was four years old when my parents brought me to my first UNH vs Maine game at Alfond Arena. We had front row seats so naturally when one of the guys was checked into the boards, I got scared. I thought for sure they were trying to hurt each other. I ended up bawling my eyes out and begging my dad to make them stop! I was so afraid someone was going to get hurt. As the game went on, my dad further explained the physical aspects of hockey and I fell in love with the game. I am passionate about college and professional hockey. Of course, soon after that, it wasn’t uncommon for me to lose my voice during games from cheering the team on so much throughout the game. Being the only girl of four children, hockey has allowed my brothers and I to bond. My parents still have their season tickets at the Alfond and make it up to most games. Hockey is really a family event in my house. I still meet up with my parents and our family friends before each of the home games. If I am traveling, I call my dad before and after to talk about the game. FTS: Which do you enjoy more – calling hockey games or contributing to WMEB’s weekly hockey show? Why? WK: I enjoy doing the color commentary during the games more only because I get to see the things that we have spent the last week discussing. As a sports department, we can read all the articles, talk to whomever, analyze stats, but it’s really about what we see on the ice. We have a great time during the live weekly show, but the game broadcasts allow us to perfect our skills in roles we hope to have in the future. The games are also more intense then the atmosphere in the WMEB Studio. I am very fortunate to have been able to spend this season broadcasting alongside our play-by-play guy, Cody Beckett. I could not have asked for a better partner. Cody is incredibly knowledgable about the game and he is also a great teacher. FTS: How did you and Cody prepare for and manage through your Frozen Fenway rain delay coverage? WK: Cody and I knew the chances were against us with the weather cooperating, but we never expected it to be like that. At first, I thought the lightning was just the flash on [sideline reporter] Alex’s camera behind us. I was somewhat leaning out of the press box window when the thunder hit. Things like that are bound to happen, especially when you are counting on the weather to cooperate. It was one of those things that we just rolled with and kept going. Cody and I have a very good dynamic so we just fed off each other. We are also two people who do our research and make sure we are well prepared, which paid off in that setting. We exchanged roles with our sideline reporter Alex so we each could use the restroom but, other than that, we just hunkered down. We knew it was most likely going to be the only time we were ever going to get the chance to broadcast UMaine hockey against BU at Fenway Park in a downpour. We were so thrilled to be given the opportunity to broadcast at Fenway. At that point in the day I was on my sixth or so cup of coffee so I was ready to go and I wasn’t going to let the rain impact our broadcast. In the end, I think more people ended up turning us on because of how entertaining we were during that delay. FTS: We tuned in and, in all honesty, found your rain delay coverage far superior to NESN’s. Of course, we’re biased, but still. Besides the memorable rain delay, what was the highlight of the entire Frozen Fenway experience for you? WK: Frozen Fenway was, by far, the most memorable experience of my life. Looking back, I still find myself smiling because of how great a time had. Even though I’m not a huge Red Sox fan, it was awesome to have free range access to the entire park. There were many times where I looked around the park and thought about all the people who would do anything to have such an experience. I was also lucky enough to meet NESN’s Jamison Coyle and GM of the Red Sox Ben Cherrington. FTS: What are your thoughts on year one of the Red Gendron era of UMaine hockey? WK: Anything worth having takes hard work and time. Coach Gendron has done an outstanding job of returning the team to a place where the guys understand where they are and what they can become. From the day he walked into the Alfond as head coach, the atmosphere in the Alfond and surrounding the team changed. He brings a history of success. He wrote the book on hockey. I think the biggest impact he has made thus far is instilling the value of accountability to his team. The guys are getting to a place where they are not afraid to have a bad shift because they don’t want to the coach mad at them, it’s because they don’t want to disappoint each other. Things will not be changed overnight. Perfection does not exist, however the University of Maine Men’s Hockey team will strive to achieve perfection every single day. This team is defined by its work habits on and off the ice. FTS: What other sports do you enjoy besides hockey? WK: I appreciate all sports. Right now I am really into the Winter Olympics. FTS: What was your experience like on NESN’s “Schooled”? WK: I was a first year student when I was selected to be on “Schooled” so it was definitely a huge thing for me at the time. My role of the show was the “pageant girl” because I had just come off of competing for Miss Maine Teen USA. It was a lot of fun traveling to both Northeastern and Boston College. I had never been to either school and was in awe of how beautiful BC’s campus is. I am a very competitive person and a perfectionist, so losing in part 3 of the final challenge is a feeling I will never forget. “Schooled” was my television debut and it solidified my dream of wanting to become a sportscaster. To this day, I am still one of the youngest people to have appeared on the network outside of an athletic event. FTS: What are your short-term and long-term goals post-graduation? WK: Short term I want to be employed by graduation in May. My goal is to get hired as a sportscaster. Long term I want to broadcast a Stanley Cup game. I also enjoy the business side of sports so really long term from now I would like to be the Athletic Director of the University of Maine. FTS: Hey now, give Karlton Creech some time…he just got the job! Besides sports, what are some of your other interests and hobbies that occupy your free time? WK: I am in my final semester of my undergraduate career which is keeping my pretty busy. I am an active sister in Alpha Phi, one of the sororities on campus. I also manage the Alpha Phi Merchandise Swap, a small business I created one year ago where I work with greek retailers to design and create Alpha Phi merchandise which I ship all over the United States and Canada. I am a workaholic and have three jobs at home. I am a Campus Ambassador for Southern Tide, a clothing company based out of South Carolina. I am interning with the Portland Pirates and doing as much work for them as I can from Orono. I am also a Rink Reporter for USCHO. I serve on the committee for the Shawn Walsh Memorial Golf Classic. I also love spending time with family and friends. I have two nieces and two nephews, so it’s fun watching them grow up. FTS: Who are your sportscasting heroes? Who are your favorites working today? WK: Being from New England, I look up to guys such as Andy Brickley, Tom Caron and UMaine alumni Bob Beers and Gary Thorne. Both are known for their work ethic and being phenomenal broadcasters. I appreciate the boldness of Howard Cosell. He didn’t sugarcoat anything and really said what was on his mind. I don’t think that is something you could get away with today. John Buccigross is another hero of mine because he has put the spotlight on college hockey. He has also used his fame in a philanthropic way with the Bucci Overtime Challenge, which benefits numerous causes. FTS: Gary Thorne is one of our favorites, too, and you’re obviously a sportscasting historian if you know about Howard Cosell. 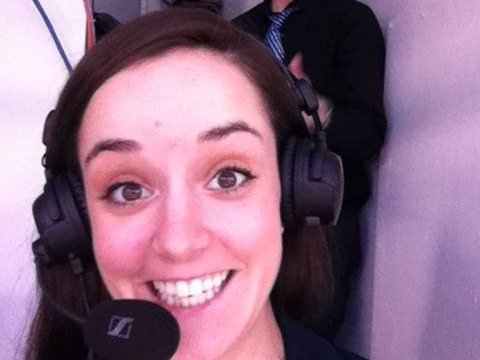 Getting back to present-day sportscasting, you don’t see many (if any) female color commentators in hockey. Do you think that’s a barrier that can be broken down at the professional level, or will women be forever relegated to “sideline” duty? WK: I believe women have come a long way to earn the respect of their peers in the sports broadcasting field. For a while, women weren’t even allowed in the locker rooms post-game. As a female I fully support women being in the box announcing games at the professional level. I think the reason we haven’t seen it more, especially in hockey, is because we have outstanding announcers already in that role. The play-by-play and color commentators don’t change a whole lot season to season. I believe that if a woman was qualified and there was an open position, she would be looked at equally as a potential male candidate. With that being said, I think the women we see now in sports broadcasting on the sidelines are comfortable there and enjoy having that position. Frankly, I don’t think Erin Andrews wants to be in the booth. FTS: Lastly, what are you currently filling your stein with (drink of choice)? WK: A vanilla soy ice coffee from Starbucks. Given how busy Whitneigh keeps herself, it’s no wonder she fills her stein with caffeine! We thank Whitneigh for taking a few minutes from her various responsibilities to speak with Fill The Steins. As a reminder, you can hear Whitneigh on WMEB-FM, channel 91.9, and streaming online at www.wmebsports.com.